Disclosure: Book was received for review purposes only. Information provided and shared with permission. Any opinions are my own. 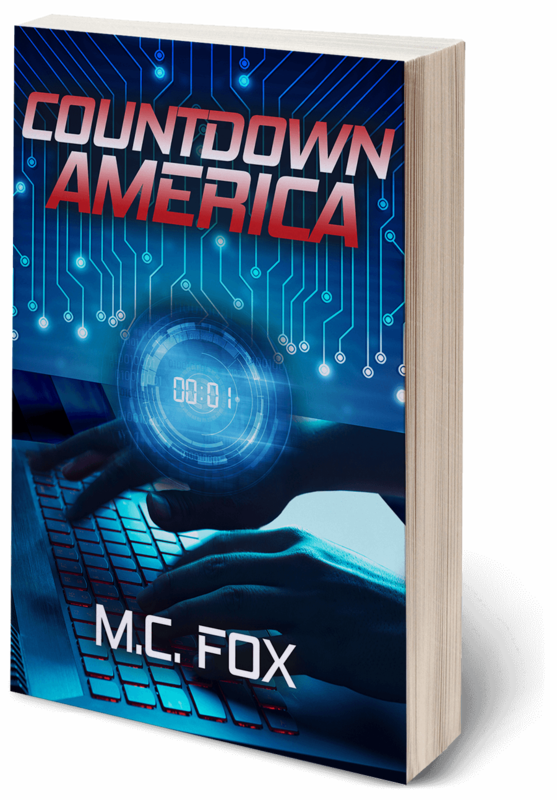 Countdown America is a new political cyber espionage novel with a fierce female protagonist who also happens to be a single mom, providing a thrilling and relevant read that is also an inspiration to women everywhere. "Truth can often seem stranger than fiction. The United States has certainly seen that played out in full over the past few years – from politicians gone haywire, Russian hacking scandals, the women’s empowerment movement and more – each news day seems crazier than the last." Author M.C. Fox looked at all that was happening around her – the unstable political climate, crazy international scandals and powerful women stepping up – and realized she had the perfect ingredients for a novel. From there, Countdown America was born, a whirlwind of a spy story set in the world of political cyber-espionage, all led by a fierce female protagonist. Countdown America follows CIA agent and single mother Isabella Bendel. After the loss of her husband, she accepts a promotion to chief supervisor – a much less dangerous position than what she's accustomed to—so she can raise her two children without fear of leaving them without any parents. But any illusions of safety are shattered when, while on her Sunday morning jog in a Washington, D.C. park, she survives a brutal assassination attempt. She hauls her assailant into CIA headquarters, confident she can get to the bottom of why he was after her. Her blood runs cold when she learns the truth...as he was trying to take her out, armed terrorists abducted her children and mother right out of her home. Pushed to the brink of what any mother can endure, Isabella calls on all of her training and deadly skills to get her family back. During this mission, she fights her way through. Question: Tell us what Countdown America is all about. M.C. Fox: Countdown America is about a single mom, Isabella Bendel, who rises through the ranks of the CIA to Chief Supervisor of the Cyber Terrorism Unit. She finds herself at the other end of a case she never thought she would ever be on. Trying to figure out why she has become a target, while also trying to figure out why her family has been abducted. This is the toughest mission she has ever worked. She finds herself fighting her way through assassins, cyber-terrorists, and duplicitous fellow agents, as she uncovers a Russian plot that is hell-bent on destroying the United States. Fox: Initially it was hearing about Russia’s attacks against countries of the former Soviet Republic. More recently, the news of the moles found in the United States, the hacking of our elections, and as reported, political meddling in several other countries. I thought it was the perfect ingredients for a spy story set in the world of political cyber-espionage. Q: Isabella Bendel seems like a fierce character. What was your motivation behind creating such a strong female protagonist? Fox: Firstly, I wanted to create a female lead. There are not a lot of female lead characters in the spy genre. In my mind, Isabella couldn’t be anything but strong considering she is a single mom, and in her case, her line of work. I believe she is a good role model for women. She rises above her emotional distress and her vulnerability and carries on with the task at hand. Q: It is interesting that you created Isabella to be a single mother. What was your thought behind that choice? Fox: My thought was to create a strong yet vulnerable character. Being a single mom can be very vulnerable. You are doing it all. There are so many single mom’s out there that feel they can’t make it on their own, can’t do what they need to do to take care of their children. I think it can speak to those single mom’s that don’t feel they can do it all. When they see Isabella doing it, it could help them see that they can too. Q: And why cyber security – why did you tackle that subject? Fox: It is a very “now” thing and I thought it would make a great plot line. We hear more and more of cyber related threats out there, for example, identity theft, and hacking financial institutions to name a few. More recently Russia’s reported involvement in the hacking of the elections in the United States. Everything is cyber related and it is a real threat, as we see played out in the news more and more. Q: Beyond being entertained, what do you hope readers take away from reading Countdown America? Fox: I hope it moves people to rise above circumstances and succeed. To move past the notion that because they are female, or vulnerable, that success is not an option. I also hope to bring awareness around cyber threat. We live in a day and age when everything is cyber related. The threats are real and so too must be the efforts to remove that threat. M.C. FOX has long been fascinated by the world of espionage. Living right in the heart of New York City, she constantly is inspired by the sights and sounds of a large city, and how that forms the perfect environment for a fast-paced thriller. Given our currently unstable political climate, as well as the Russian hacking of the election, she knew that now was the perfect time to bring her readers a spy story set in the world of political cyber-espionage, led by a fierce female protagonist. Find more information here: www.mcfoxauthor.com. Enter to win the book: Countdown America below. Ends May 5, 2019. Open to US residents only please. Good luck.